This Saturday we went to the Pacific Science Musuem with friends of ours. It was really fun. Owen really loved the Dinosaur room. It was a big room filled with mechanical dinosaurs. The museum was filled was lots of things to do with kids. The museum is located right at Seattle Center. This is an area in Seattle where a lot goes on!! It is right by the base of the Space Needle! It was a very fun day!! Followed by a lazy Sunday. Good weekend! Grandma and Grandpa Reilley Visit! We were so happy to have Grandma and Grandpa Reilley visit us for a week! It was a busy week filled with lot of fun activities. We showed them Snoqualmie Falls. We also spent one day downtown. We went to Pike Place Market and Gas Works Park. Gas Works park is pretty cool because it is right across the bay from Downtown Seattle. So the view from the park is downtown Seattle! 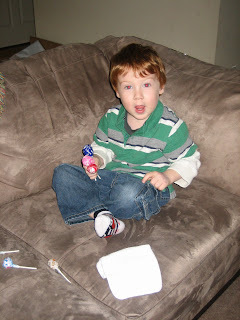 While they were here we celebrated Seamus's second birthday! 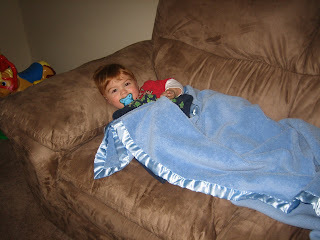 It is hard to believe that he is already 2 years old! Other than that we spent time relaxing and enjoying time with the family! Brandon and I even got to go out a couple time by ourselves. Halloween was a super busy, but fun day. Brandon was out of town, so we really missed him. We started the day trick or treating in a cute shopping center. Then we came home and took an afternoon rest. 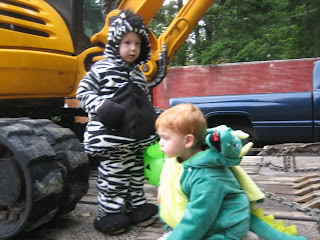 After that we went to "Trick or Trucks." 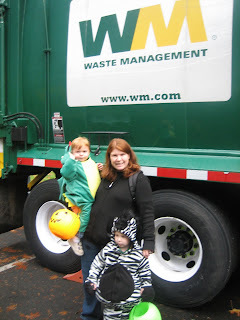 The city of Maple Valley set up trucks and the kids could climb on them and get candy! Then it was back to our houses to wait for trick or treaters! The boys loved handing out candy to all the kids that came to the door. All in all it was a fun day. 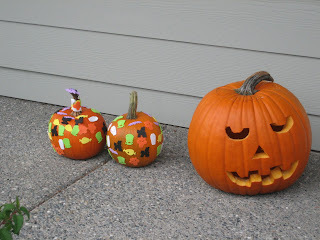 We got 3 pumpkins for Halloween! 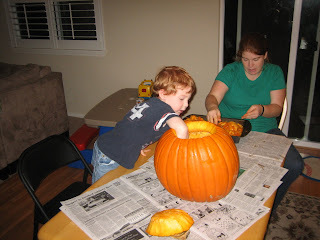 A big one for carving and 2 smaller ones for the boys to decorate. Owen and Seamus decorated their pumpkins with felt Halloween stickers we bought at the dollar store. 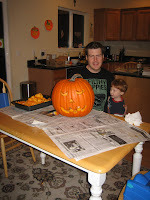 Brandon did a great job carving the bigger pumpkin! Then we dried the pumpkin seeds and toasted them! Yum!